People keep asking what’s going on with renovation–it’s mostly been on the inside, and it’s been busy! Wall framing is complete in almost all areas, as well as rough-in for systems. Shafts sites are prepped for both elevator lifts (front entrance and interior). Things will start looking very different when drywall arrives next week! Work has also resumed on the re-vamped front entrance. 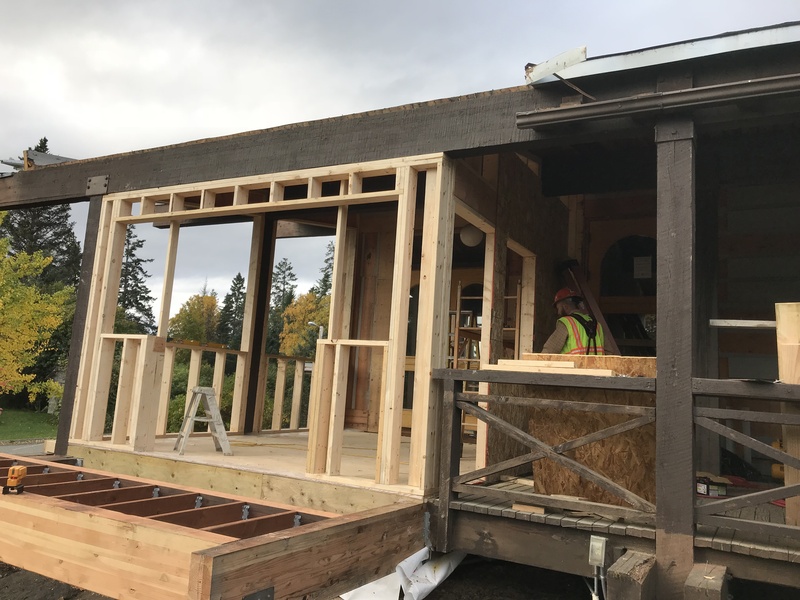 Although glass windows, doors, and siding will be installed near the end of the project, interior space, steps and roofing are coming together! *If youwould like a special sneak peak, call the museum to book your own Hard Hat Tour! These one-hour behind-the-scenes tours (including hors d’oeuvres and a beverage) are $50 per person, $175 for a group of 4, or $250 for a group of 6 (max tour size). Call the museum at 235-8635 to schedule! All-Alaska Biennial features contemporary work by Alaska artists. This juried exhibition is a continuation of the museum’s All-Alaska Juried and Earth, Fire & Fibre exhibitions, which began more than 30 years ago to encourage creation of new works in all media by Alaska artists. Guest juror Candice Hopkins is a citizen of Carcross/Tagish First Nation in Yukon, Canada, and is an independent curator and writer based in Albuquerque, New Mexico. 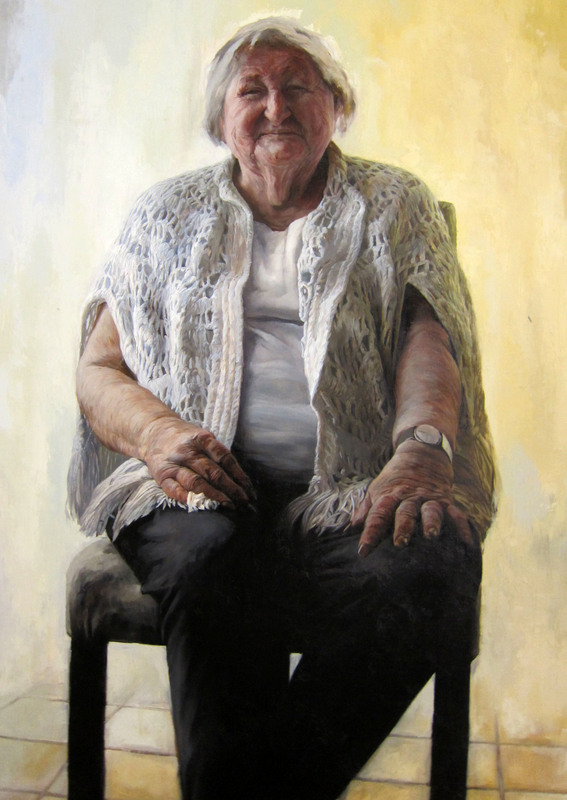 The exhibition’s call for entries drew 634 submissions from 161 artists. Works include drawing, painting, mixed media, craft, jewelry, fiber art, visual art, metalsmithing, printmaking, encaustic, ceramic, book/paper arts, photography and sculpture. Hopkins selected Anchorage artist Kristy Summers’ mixed-media piece Descend for the Juror’s Choice Award, with honorable mentions going to Anchorage artist Christopher Judd’s oil on linen on board painting, Grandma; and Anchorage photographer Mark Stadsklev’s photography giclée print No Way Out. The exhibition opened in Anchorage and travels to other Alaska locations throughout Fall 2019. All Alaska Biennial is organized by The Anchorage Museum at Rasmuson Center. Support for this traveling exhibition has been made possible with the support of: Alaska State Council on the Arts, a federal Agency; the Municipality of Anchorage, the Anchorage Museum Association and the Anchorage Museum Foundation Alaska Airlines Silver Anniversary Fund. As you may know, the Pratt Museum is currently under renovation and closed to the public. Our grand-reopening is scheduled for May 3, 2019, so what should our Members do in the meantime? We are honoring all current and new memberships with an extension on all annual membership levels per your renewal date. Renew before December 31, 2018 and your membership won’t expire for 20 months. What a great deal to make the most of your membership! Make the most of our ROAM option. This small additional fee gives you access to our wonderful sister museums across North America. Follow @Pratt_Museum on Instagram, and watch for the hashtags #PrattMuseum, #PrattRenovation2018, and #Pratt50th to see awesome pics and updates! To add ROAM to a current membership, subscribe to our e-newsletter, or if you have any questions, contact us at 235-8635 or email. All current and soon-to-expire members will be receiving letters with their membership information in October. We look forward to seeing you at the Pratt soon and showing off our improvements and new programs when we open the doors next May! Things are moving quickly along! 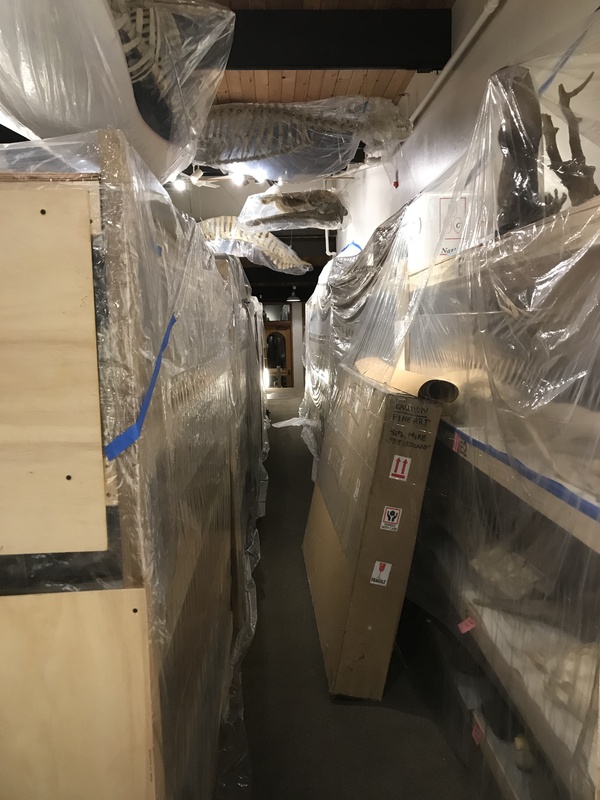 Since September, museum staff and volunteers have relocated the whole of collections storage into the former store and special exhibits gallery, which won’t be affected during this phase of construction. 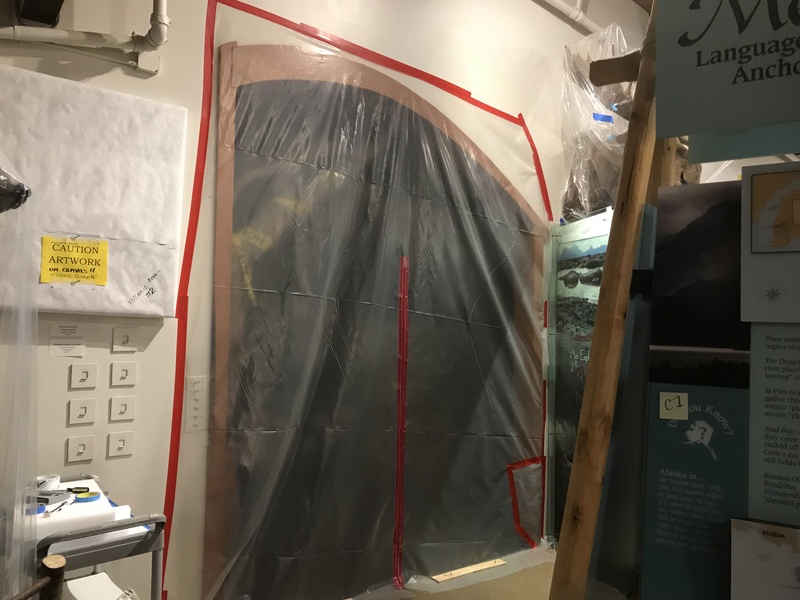 Beachy Construction has begun work to renovate the front deck and entry, and erected a dust barricade to protect the permanent gallery (and overflow storage) from their work to install a new ramp to the marine gallery. The downstairs is completely gutted and preparing for a whole new life as dedicated storage and classroom space! 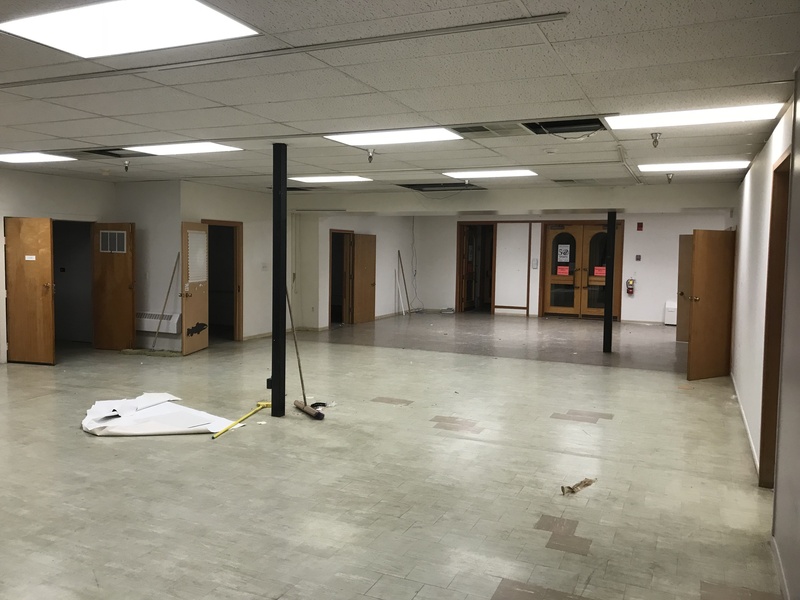 Walls are going away upstairs as we get a glimpse of a new, wide open gallery space! How do we know, relate to, and narrate the complexities of living in the North? What words resonate with us when we talk, hear, or read about the place we call home? What sparks us to learn more, change our behavior, and show empathy towards a place and its people? 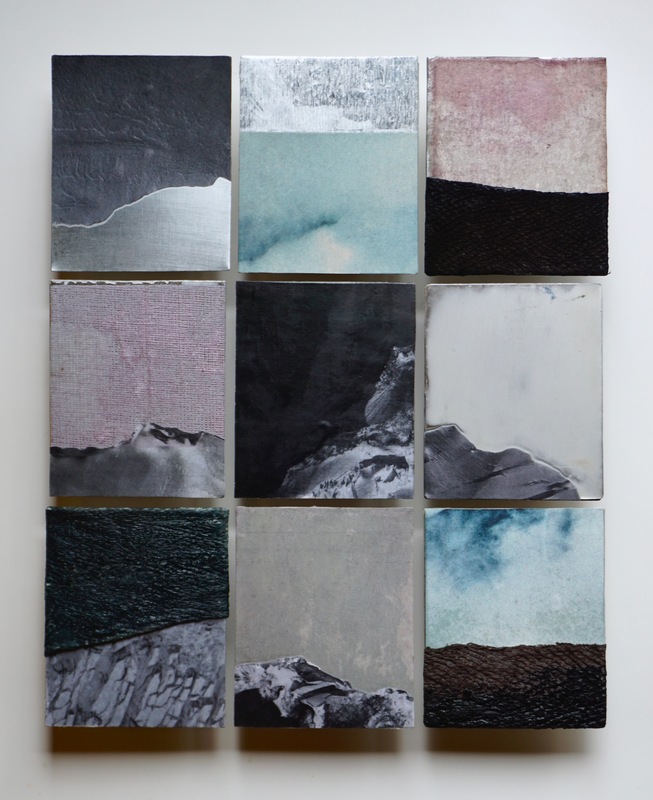 These questions inspired Haines artist Katie Ione Craney to create a new series of work based on deciphering the roles of women within the literary and physical landscape. Opening reception: Friday, August 3, 5-7 p.m. 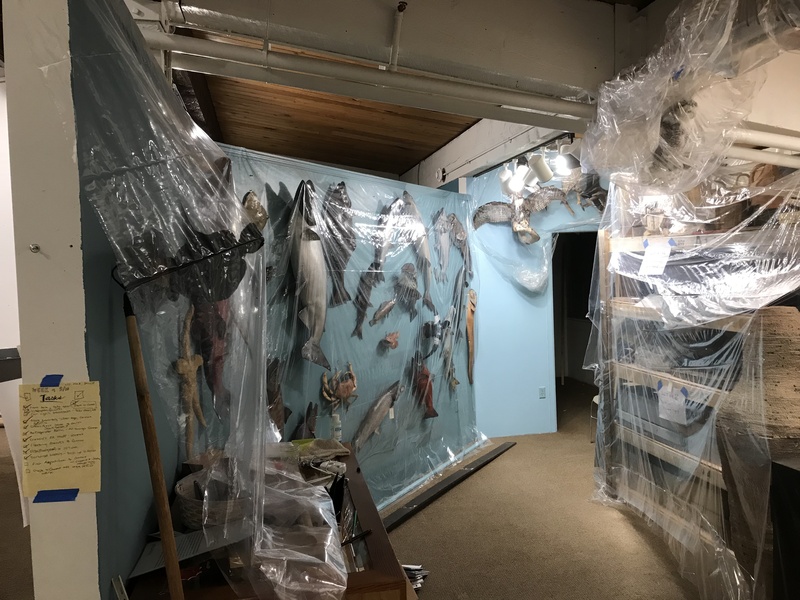 The Pratt Museum has been a part of the Kachemak Bay region for 50 years! Do you have a fond memory or story of the Pratt Museum that you’d like to share? We’re collecting reflections in any form: stories, poems, haiku, et cetera! Compiled contributions will be gathering into a publication to debut in 2019. Please complete the following form with your story. If you’d like to add more, or send a flashback photo, send to info@prattmuseum.org. Thank you for being a part of the Museum! As the Pratt Museum looks back on 50 years of collecting community history, we also look to the future to ask what we will collect over the next 50. How do you envision our community and our museum in 2068? mages submitted through July 1, 2018 will be part of a large, progressively growing collage. Join us for Kachemak 2068 and Ties Us Together May 4 – July 1, 2018! What are the activities that tie our community together? How would you represent our community to an audience in 2068? Submit a photo of one activity that ties us together! Images will be part of a large format collage in Ties Us Together, a community-based installation by Sharlene Cline, May 4 – July 1, 2018. Images submitted through June 1, 2018 will be part of a large, progressively growing collage. Please submit hardcopy images to the museum’s front desk. Submissions are considered a donation for art installation, and will not be returned. Inclusion is at the discretion of the artist. As the Pratt Museum looks back on 50 years of collecting community history, we also look to the future to ask what we will collect over the next 50. How do you envision our community and our museum in 2068? Contribute to creating our shared future through this special anniversary exhibit curated by Sharlene Cline. Goal: to explore visions of Kachemak Bay fifty years in the future. Artists may submit work in any medium: visual art, media, or narrative. * Please inquire about extra large works or special concerns. Contact Scott Bartlett, Curator of Exhibits: sbartlett@prattmuseum.org or 907.435.3335.